Respect the Reds? On bike, is it safer to run red lights? There are an endless amount of theories on this topic that are discussed, at great length, during almost every time you get more than 2-3 cyclists together. Legally, here in the US (and likewise in CA) bicycles are the same under the law as cars, meaning they get the same benefits (full use of the lane, etc ) and must obey all the same laws (stop at reds, etc). On bike, more so than in a car, sometimes safety trumps legality and when you take “the law” out of the picture it changes very rapidly – with opinions on what is actually the safest practice shifting from biker to biker. The conclusion he comes to is that a car is a very different vehicle than a bike, and behaves differently in every aspect so the rules for one should not apply to the other. It’s not a new idea, nor one that isn’t discussed frequently. What do you think, laws aside, should cyclists respect the reds or use them as advisory only? Why don’t we aim for “parity with cars” before “special rules for bikes”. Once we get all the cars to treat bikes as equals then we can worry about whats really best. I’d say we’ll be ready for that follow up discussion about 2054. I’m kind of a stickler for obeying the “car rules” when riding my bike, but I tend to take every situation as it comes. Especially when you’ve got frustrated, completely unaware of your right to use the lane, drivers behind you at a red, taking an early start and getting out into the lane can save your life. I must say it is a strange experience to sit at several cycles of a light while thousands of Midnight Ridazz stream past you with no regard for red and green. While I’m sure it feels great for the cyclists, it seems like a better system could be worked out for all. There are certainly occasions when safety dictates that a cyclist not rigidly follow the rules of the road. But I think Alex Marshall takes the argument too far. Especially on crowded urban streets, a properly ridden bike is far more car-like than not, and all users of the road are usually well served by cyclists following the rules accordingly. This especially applies to red lights, where nine times out of ten the cyclist is risking his/her safety, not promoting it, by running the light. Red lights as stop signs. I do think that cyclists and cars should have different guidelines outlined for them. But certainly the first step would be to get the idea of “sharing the road” in the first place to gain traction among motorists. I spoke with a bike cop friend about this recently and many officers do agree that it is safer for a big ride to run the reds and will not harrass or cite the riders….but you need look no further than Culver City to find a different approach to this problem!! 9 cop cars for a ride of less than 100 people…. i should add — safety first!!! It is usually never a good idea to run against the flow of traffic….and breaking the law is, like totally wrong. I think common sense in terms of safety should trump laws regardless of if you’re in a car or bike, so I don’t see the need to make exceptions for anyone. I really know little about the safety issues surround packs of bike riders, otherwise I might argue that groups like Midnight Ridazz should need to get a permit and police escorts. However, the frequency of the rides are so minimal that to argue they actually disrupt traffic seems insane. What does bother me, though, are bike riders who take advantage of both pedestrian and auto status as they see fit – using the sidewalk and cross signals when a redlight is present, for example, and then cutting back onto the road ahead of traffic. I really like the street engineering philosophy of “Shared Space.” In practice on many European streets, it is the idea that everyone (pedestrian, auto, bike, skater, tractor, combine, chariot, buggy, robot, segway, rickshaw, giant hamster wheel) are treated as equal. The emphasis is on personal responsibility. I’m with Markland – you either follow the rules or you don’t. Bikes expect preferential treatment when the truth is it’s dangerous enough to be in a car, let alone on a bike. Abide by the road rules or don’t ride in the street. I’ve been stuck at an intersection when about a million bikes caused us to miss FOUR light changes. That blows and believe me I wasn’t the only one losing patience. Not following the law is an invitation to mayhem. In this case potentially dead bicyclists. 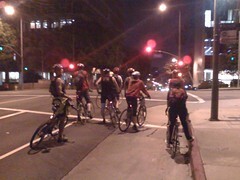 I totally understand the Midnight Ridazz and the pedalthons. Our own Will has written where LAPD officers made impromptu breaks a couple of times so they didn’t break the runs rhythm. I’m fine with that. I’d actually like to see them get permits to help get those breaks. Yes it would ruin the fun and impromptu aspects but a little safety is nice. Even though they do it in the middle of the night and traffic is light, its still a safety issue too. During the day is another issue. If they want to disobey traffic laws they can. It’s civil disobedience, we all to it some form like 5 mph over the limit, not signalling for turns either intentionally or out of carelessness. When ever you decide to disobey a law you have to be prepared to suffer the consequences. The consequences for not obeying a red is getting creamed and dying. Your choice. Make it wisely. First and foremost whenever I’m riding solo I stop at red lights. I may scoot across against them after an intersection clears, but I’ll stop first and ask questions later. David I hear where you’re coming from but unless there’s a municipality that’s enacted laws against biking on the sidewalk, that bothersome scenario — especially in L.A. — isn’t illegal. Cyclists here are accorded the right to ride on the sidewalks providing they do it in a safe manner mindful and considerate of any pedestrians present. And Ruth, I just don’t think it can ever be so black-and-white as you insist it be, especially when you’re viewing it in the relatively narrow context of large group night rides such as Critical Mass or Midnight Ridazz. I’m not saying bikes have some sort of waiver to do as they please on those events and you as a motorist have every right to be frustrated at experiencing delays and to call for compliance, but its’ an entirely different aspect for an individual cyclist. For example, when I’m stopped by myself on 4th at Wilton with my bike at that hellaciously looooooong light there, sometimes I’ll wait out its interminable length and sometimes I’ll look left then right then left again and if all’s clear get going. To demand I abide by that red light or stop sign or whatever at all times or don’t ride in the street is a bit idealistic. Cyclists here are accorded the right to ride on the sidewalks providing they do it in a safe manner mindful and considerate of any pedestrians present. I would suggest, and enthusiastically so, that there is no safe and considerate way to ride a bike on the sidewalk. In my opinion, it’s the single most dangerous/stupid thing that I see people commonly doing on bicycles. I always figured that jaywalking was less common in southern california because the streets are wider and traffic flows both ways. In many east coast cities (with narrower streets or more one way streets) jaywalking is the norm. It seems to me that crossing at a red, on a bike (whose acceleration over 30 ft. is often better than a car) should cause about as much of a concern as alert jaywalking. Which is very little. As for the transition from vehicle to pedestrian and back. As I see it, that’s the liberty you get when you are transporting yourself on a 20 lb wheeled vehicle, the only threat you pose is to yourself. When making a left on a busy street without an arrow, I don’t see the problem with entering the vehicle left turn lane, following the walk signal to the corner on my left, then proceeding to cross and continue to my left when the light turns green. But traveling against traffic, I’m not ok with that. Again with all this black-and-white points of view. Must be nice to see things so clearly. Lest I be misconstrued as endorsing sidewalk riding, I was mainly addressing the legality of it. But I have done it and in the circumstances it was neither dangerous nor stupid. Will – I know there are exceptions where riding on the sidewalk is not the worst thing one could do (kids riding on their own block, for example). As someone who rides all over Los Angeles, I’ve seen more people almost killed either weaving from sidewalk to traffic as it suits them, or crossing streets from corner to corner on a sidewalk. Cars just cannot see sidewalk riders, and again, in my opinion, sidewalk riders seem to have the lowest skills of any group of riders, in general. Marshall is right: sidewalk riding is rarely safe for the cyclist, let alone others s/he is sharing the sidewalk with. Indeed, it’s my opinion that the only safe way to ride on a sidewalk is to do so at the pace of a pedestrian, which begs the question of why be on a bike in the first place? You might as well be walking (which itself is a perfectly respectable mode of transportation.) At typical casual cycling speeds (10-20 mph), bikes are much safer sharing the road with motor vehicles. Joshh, there is absolutely no reason why you can’t make a left turn from the left-turn lane just like you would in a car. Indeed, the more you ride like a car, the more drivers will respectfully treat you as one of them. This is precisely why running red lights is such a bad idea, even when apparently safe. It suggests to drivers that you don’t belong on the road, that you aren’t a “normal” user of that public right of way since you are apparently incapable of following the basic rules of the road. Riding a bike, particularly on the streets of L.A., is a political act. Be mindful of the message your actions are sending to those around you. Next PostNext Win Tix to Hot Hot Heat this Saturday Sunday! Woo wee!